Are you ready to share your ideas on why CARICOM must advance the Region’s sustainable energy transition and your vision for how your country can support this transition? As part of Energy Month, the CARICOM Energy unit is inviting college and secondary students to write letters or essays to the CARICOM Secretary General and CARICOM Heads of Government. Prizes include laptops, projectors for schools and the Golden Pen Award for Best Overall Entry. The competition is open for participation to all CARICOM nationals and citizens under three (3) categories. Entries will only be judged if they meet the eligibility criteria. 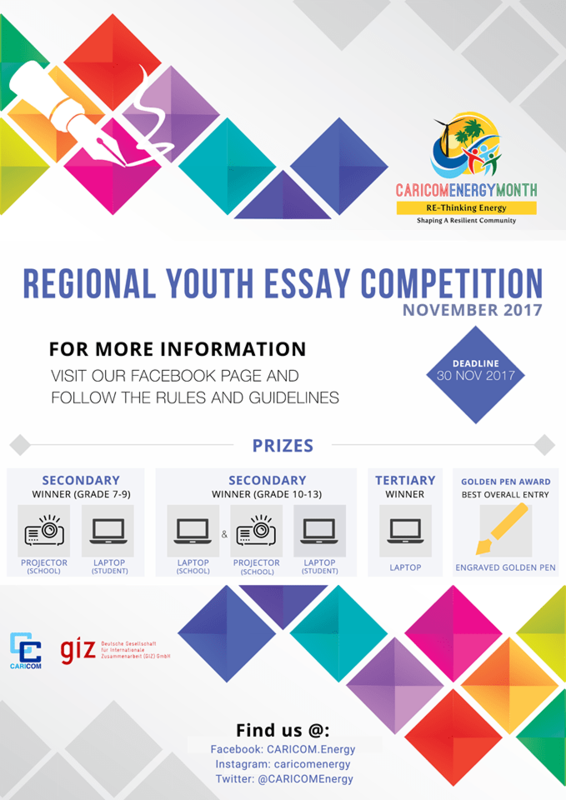 Children and immediate families of staff of the CARICOM Secretariat and the Regional Youth Essay Competition Judges are not eligible to participate. Winners will be announced on Facebook and via email at the end of January 2018. The Essay Competition begins at 9:00 am on Wednesday, November 1, 2017 and ends at 12 midnight on Thursday, November 30, 2017. Entries submitted after the entry period will not be eligible. A teacher or parent must submit the entry/entries on behalf of a secondary school student. The full name and age of the student, school, and grade/form (Please check your school policy on student work being published). Teacher: Name, telephone number, e-mail address and your school address. A signed declaration form which requires the signature of the parent or teacher and school principal along with the school’s stamp. Example of the format can be found at Annex I. All participants desirous of participating in the competition must pre-register by completing the registration form found here. Each entrant will receive a confirmation of registration email from the CARICOM Energy Programme. A signed declaration form which requires the signature of a lecturer. Example of the format can be found at Annex II. Entries not meeting the requirement will be disqualified and removed from the competition. The CARICOM Secretariat will award one prize to the winner of each Category and a Golden Pen Award will be given for the best overall entry within the competition.